This weighty book is written by 'insiders' (the nonagenarian author and his assistants are, or were, all Life Fellows of Caius College, Cambridge), for 'insiders' (the current and future fellowship of the College). 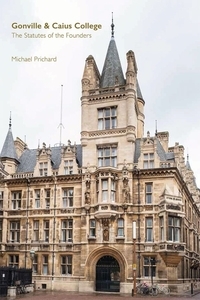 To understand and appreciate it fully, the reader needs to be a member of that fellowship, and to have at his or her elbow another work by one of the author's assistants, Christopher Brooke's A History of Gonville & Caius College. The book is divided into two halves: the first comprises an edition and translation into English of the College's foundation statutes (3-265), followed by 'The Interpretation by Matthew Parker of the Statutes of John Caius' and 'Supplementary Notes to Caius's Statutes' (266-310). This is the most generally valuable part of the book. The second part consists of 'Background', written by Christopher Brooke (313-368), and 'Aftermath', minute examination of controversial issues raised, or at least not resolved by the statutes. It is divided into five topical sections: 'The Fellowship and the Governing Body', 'The Master's Negative Voice', 'The Norfolk Preference', 'Stipends' and 'Dividends' (371-553). There follow a series of documentary Appendices (557-626). It is perhaps astonishing that the foundation documents of most of the older Oxford and Cambridge Colleges, when they exist at all, do so in old editions; most, like Caius's, those published by the Royal Commissioners in 1852 and 1853. In the case of Caius the situation is particularly complicated, given that the College had three founders, each of whom issued statutes, the second of which exists in no fewer than seven versions, most of them 'corrected' versions of the first. The Commissioners did not print the unfinished and probably unused statutes of the first founder, Edmund Gonville (d. 1351); denied the best versions of the other two by the then Master of the College, they made a mess of those produced by the second founder, Bishop William Bateman of Norwich (1354), and printed inaccurately those of John Caius (1573). However, even before the appearance of the printed edition, the College was hopelessly embroiled from time to time in the problems posed, firstly, by the question of which version of Bateman's statutes was 'authentic', and, secondly, by the relationship between Bateman's statutes and those of Caius, whose statutes were precise, lengthy and detailed, though they proclaimed only to be supplementary to Bateman's. Some of the problems raised by these circumstances are still alive today, such as the fact that at Caius, alone of Oxbridge Colleges, the Governing Body consists of fewer than the total Fellowship. The huge 'Aftermath' section takes us through the detail of these problems, the approach far more legal (and, indeed, legalistic) than historical. This is the section for which the interested reader most needs the guidance of Brooke's History. For example, more than once incidents and persons are introduced without detailed explanation that only appears, if at all, at a later stage in the text. A prime example is the set of fellowships established by Joyce Frankland in 1592. They are first mentioned on p. 375, without explanation, or any mention of the lady's identity. Further details of the fellowships (and scholarships) are found at pp. 430-1, but still no reason is given for their establishment. For the full story one needs recourse to Brooke's History, pp. 95-98. Similarly with the fellowships founded by Sir Thomas Wendy and Stephen Perse, details of which are scattered widely and disjointedly through these pages. Roger Lovatt: The Triumph of the Colleges in Late Medieval Oxford and Cambridge. The Case of Peterhouse, in: History of Universities 14 (1998), 95-142.